The theme of the conference is “Transfiguration in the Eucharist” and will focus on the Eucharist as the way of beholding Jesus in His glory. Special guest speakers will include Bishop Athanasius Schneider of Astana, Kazakhstan, Rev. Cassian Folsom, OSB from Norcia, Italy, Bishop James D. Conley of Lincoln, Nebraska, the head of ICEL, Msgr. Andrew R. Wadsworth and many other distinguished presenters. In addition, Alex Begin will conduct workshops for priests, deacons and seminarians on celebrating the Extraordinary Form of the Mass and Nicholas Lemme will lead workshops on the basics of Gregorian chant. From its modest beginnings in 2013, this conference has grown into a premiere annual event with participants coming from throughout the United States and beyond. The mission however remains the same: to educate and inspire the faithful about the life-changing realities of the Holy Mass, to encourage dignity and beauty in the celebration of the sacred liturgy and to promote the use of sacred music according to the mind of the Church. The conference will include an opening night reception, twelve important and informative lectures, four Mass and chant workshops, four beautifully celebrated liturgies in both the Ordinary and Extraordinary Form, as well as the Dominican rite, two lunches, an evening banquet, priests regularly available for confession and plenty of time for fellowship. Additional faculty will include: Archbishop Alexander K. Sample, who will celebrate the opening Mass, Msgr. Gerard O’Connor, Rev. Gerard Saguto, FSSP, Msgr. John Cihak, Canon Lawyer Magdalen Ross, Msgr. Richard Huneger, Rev. Gabriel Thomas Mosher, OP, and Rev. Theodore Lange. 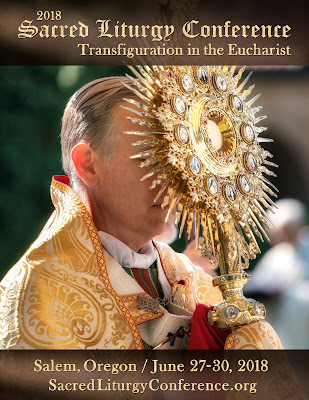 The Sacred Liturgy Conference is open to anyone interested in the treasures of the Catholic liturgy and promises to be intellectually, liturgically and spiritually enriching. Come join us as we deepen our understanding and love for the Holy Eucharist, and the Holy Sacrifice of the Mass.